After announcing in 2014 it would bring an industrial 3D printer to market within two years, HP went mostly silent -- until now. Next week, HP plans on pitching its Multi Jet Fusion 3D printer at the South by South West (SXSW) conference in Austin. Steve Nigro, president of 3D printing at HP, said the MultiJet Fusion 3D Printer is on schedule for mass production and will ship late this year; it will retail for between $100,000 and $1 million. HP is not interested in going after a piece of the $4 billion-to-$6-billion 3D printer market, Nigro said. Its focus is on the $12 trillion manufacturing market. A spiral "bottle" printed by the HP Multi Jet 3D printer demonstrates the intricacy with which it can produce models. "First off, ...we're targeting rapid prototyping..., but we're really looking at the production opportunities where ultimately you start doing final parts production using 3D printing -- where Multi Jet Fusion will shine. "We're going to deliver something that's reliable," he added. "That's part of the reason it's taking us so long to put this system together. We're making sure it's a robust system." The new industrial 3D printer -- a little larger than a washing machine -- is 10 times faster and 50% less expensive than current systems on the market, Nigro said. HP has already shipped its Multi Jet Fusion 3D printer to beta customers, such as Shapeways, a 3D printing service that allows users to upload CAD designs and have them printed out and shipped back. Using production parts as an example, Nigro said 3D extrusion techniques -- where layer upon layer of thermoplastic nylon is laid down -- can take up to 83 hours to create the part. Laser sintering, where a laser fuses layers of powdered material (even metals) together, can take 30 hours. A gear assembly printed with HP's Multi Jet Fusion 3D printer. "With Multi Jet Fusion, it takes three hours," he said. 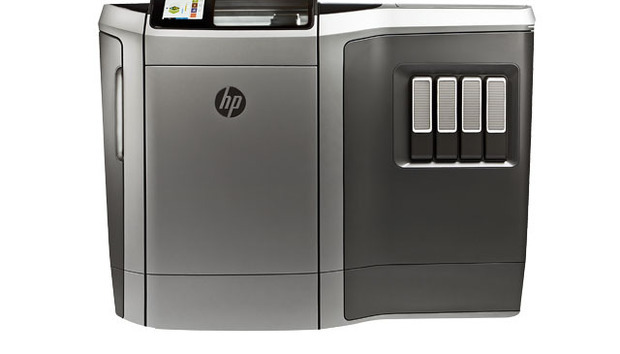 In some ways, HP's new 3D printer mimics how ink-jet printers work. The printer works by first depositing powdered plastic (about 100 microns thick, or the thickness of a standard sheet of paper) onto a print bed using a print bar that looks like a scanning bar on a typical 2D printer. The print bar has 30,000 nozzles spraying 350 million fusing agent droplets per second in specific patterns as it moves back and forth across a print platform. A detailing liquid "fusing agent" is sprayed around the edges of a printed object, giving it "sharp" details. The Multi Jet Fusion printer creating a gear. The Multi Jet Fusion printer also can modify color, elasticity, texture, strength, detail, and electrical and thermal conductivity -- within a single 3D-printed part -- at the voxel (3D pixel) level. HP is currently investigating whether the technology will be well suited for 3D printing with ceramics and metals, and has also invited select customers to help accelerate its development. The first version of the printer uses thermoplastics and multiple colors, but HP plans on expanding materials to suit a variety of production manufacturing. The machine is capable of producing high-precision parts, HP said. Most importantly, though, the 3D printer will be able to build production parts, albeit in smaller runs, Nigro said. A green brick made of concentric spirals created by HP's Multi Jet Fusion 3D printer. HP has also created an "open" collaboration program for developers who want to work with HP to create specialty applications for the printer. Like all industrial 3D printers, HP's Multi Jet Fusion will be especially well suited for creating high-quality, customizable parts for industries such as aerospace, healthcare and automotive. For example, in the healthcare industry, surgical guides or implants can be shaped to a patient's specific anatomy; a patient's hip ball and joint can be scanned and then rescreated to exacting specifications. The automotive industry could use the industrial printer to create custom cars, so buyers could specify changes to the body or interior and an automaker could then create those requirements during the manufacturing process. In aerospace, 3D printers can make parts lighter but adding enough scaffolding to ensure stability without unecessary added wieght. And 3D printing allows parts to be created on the fly, instead of the need for traditional manufacturing processes where bulk runs are stored in warehouses until the parts are needed. 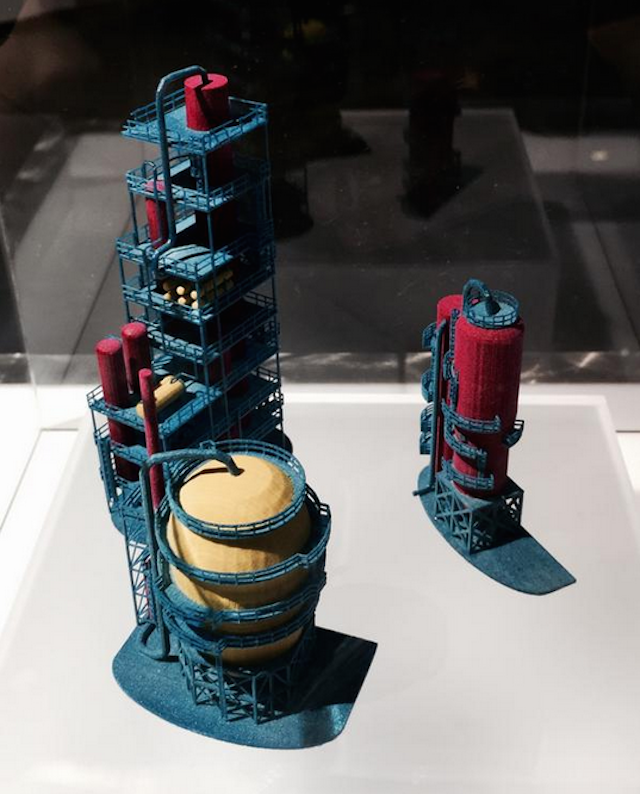 A model of an oil rig printed with HP's Multi Jet Fusion printer. There are, however, barriers to the wider adoption of 3D printing, Nigro admitted. Mostly, he said, manufacturers need to be educated on how 3D printing can change the design process and traditional production and supply chain methods. "There's a tremendous amount of education needed around how you can build your products differently [and] the raw economics," he said. "You need parts to be built faster, with higher quality and lower cost."